-Preheat oven to 350. In 13x9 inch pan, melt butter in oven. Sprinkle brown sugar evenly over butter. Gently press pineapple slices on brown sugar. 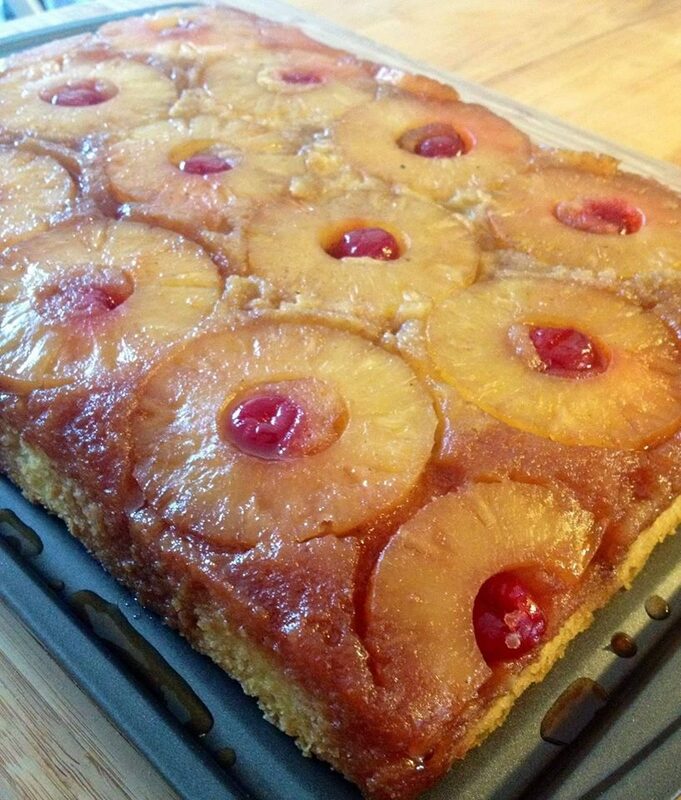 Gently press a cherry in center of each pineapple slice, and arrange remaining cherries around slices. -Add enough water to reserved pineapple juice to measure 1 cup. Make cake batter as directed on box, substituting pineapple juice mixture for the water. Pour batter over pineapple and cherries. -Bake 42 to 48 minutes or until toothpick inserted in center comes out clean. Immediately run knife around side of pan to loosen cake. Place heatproof serving plate upside down onto pan; turn plate and pan over. Leave pan over cake 5 minutes so brown sugar topping can drizzle over cake. Allow to cool & Enjoy!